If you're prone to mutter those fatal words: ‘why am I here and what's the meaning of life?' you might just need a holiday that will change your life. And what better place to find it than in Greece, home to a celebrated healing sanctuary at Epidaurus and to Hippocrates the doctor who invented modern medicine back in the 5th century BC? Propelled by a growing eco awareness, the country's holistic, spa centres and eco-friendly venues are burgeoning. But going back to nature doesn't mean that you have to suffer. "Not so long ago health and holistic holidays were perceived as a neo-hippy thing, but now they are fashionable and can often be very plush," says Kerry, owner of The Spirit of Life centre in The Peloponnese. So whether its for pampering and pleasure, or fitness, and healing, why not beat the blues this winter, and recharge your batteries in one of our top five selections of luxury yoga, health and holistic holidays in Greece? Where is it? The father of modern medicine, Hippocrates, recommended using seawater and marine weeds in a range of therapies designed to treat ailments ranging from mild fatigue to stress disorders. On the stunning island of Crete, close to the celebrity-studded resort of Elounda and just a stone's throw from Spinalonga, The Six Senses Spa at Porto Elounda (www.portoelounda.com) is the perfect venue for seawater pampering. What is it? Dotted with sculptures by renowned Greek artist Costas Varotsos, this spa has bubble tubs with panoramic sea views, oriental treatment rooms, an Ottoman hammam and a traditional Finnish sauna. What's so good about it? This is one of the most stylish thalassotherapy spas in Greece, both accommodation and cuisine are superb, and the therapies, which use a combination of Eastern and Western techniques, are cutting edge. Where is it? Blessed with several hundred kilometres of bleached sandy beach, the birthplace of philosopher Aristotle is a verdant three-pronged peninsula near the strikingly austere Mount Athos monastery in northern Greece. What is it? Perched above Cape Sani, the spectacularly sited Porto Sani Village (www.saniresort.gr) has spacious suites with sensational views over the marina, and three luxurious spas. Tailored to meet individual needs, the centre's extensive range of beauty treatments are based on the methods of famous French wellness company, Anne Semonin. What's so good about it? Handcrafted furniture and linen fabrics in suites lend a laid-back Mediterranean feel to this chic resort, while the centre's sensual beauty treatments leave you glowing from top to toe. Where is it? First mentioned by Greek poet Homer, this lush Ionian island, just a ferry hop from the more touristy destination of Corfu, has pristine clear waters, endless sandy beaches, picturesque coves and seawater caves. 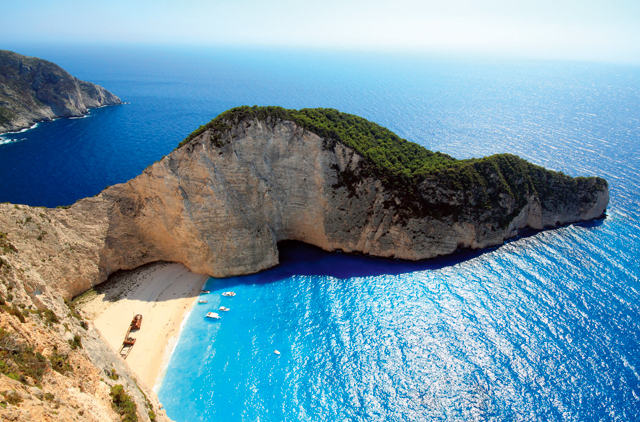 Also known as Zante, the island was classed as Greece's first national marine park in the 1980s because of the rare loggerhead sea turtles that come here to nest in summer. What is it? Housed in a series of luxurious villas surrounded by olive groves and cypress trees in the tranquil, unspoilt northeast part of the island activities at The Peligoni Club (www.peligoni.com) include waterskiing, massages, yoga and guided walks to discover the region's abundant flora and fauna. What so good about it? Describing itself as "more of a house-party than a hotel", Peligoni's laid-back ambiance and beautiful sandy beaches have made it popular with well-heeled families. Where is it? Pointing southwards from the bottom of Greece like a bunch of bony digits, the Peloponnese was named after Pelops, the king who conquered this region when Zeus was king of the clouds. The middle of these digits is The Mani, a stunningly picturesque region of tiny mountain villages dotted with pyrgospita stone towers, rugged coastlines dotted with sandy bays, mysterious caves and sheltered coves. What is it? The Spirit of Life (www.thespiritoflife.co.uk) sits above the village of Agios Nikolaos, snug in a fold of The Taygetus foothills with panoramic views over the sea beneath. Owned and run by Kerry Kousiounis and partner Wendy, the centre has several cosy apartments clustered around an elegant stone villa, with an outside kitchen where you can enjoy healthy breakfasts and dinners cooked by ex-chef Kerry as you watch wild tortoises meandering through the olive groves. Yoga and meditation in the purpose-built studio, hiking through the Taygetus foothills and swimming in pristine waters are just some of the activities on offer, while special therapies include the ancient Greek practice of dream healing and holistic horse riding, a sort of equine yoga designed to create a special rapport between animal and rider. What's so good about it? Kerry and Wendy's unfailing, but never intrusive, attention, combined with excellent teachers and ex-restaurateur Kerry's healthy, flavour-packed cooking, mean you may never want to leave. Where is it? Covered in a fur of pine forests and culminating in the 800-metre-high Kochila mountain, Skyros is famed as the burial place of romantic First World War poet Rupert Brooke. The southernmost and largest of the sun-baked Sporades islands, this stunning island renowned for lobster spaghetti and other gastronomic specialities, is an ideal spot to pick up a new skill as you recharge your batteries. What is it? Housed in an elegant mansion by a sandy beach surrounded by citrus-scented pine trees, The Skyros Holistic Holidays centre (www.skyros.com) offers a plethora of creative courses ranging from life-coaching and travel writing to belly dancing and stained-glass-making. What's so good about it? Skyros Holidays' blend of stunning scenery and holistic activities guarantee a stimulating holiday for the whole family. Emirates (www.emirates.com) has daily flights from Dubai to Athens where you can catch connecting flights to various destinations in Greece with Aegean air (www.aegeanair.com) or Olympic Air (www.olympicair.com). 1. Is it possible to turn the heating down? 2. Is your food organic? 3. How do you support the local community? 5. Can you tell me about your ethical policy?